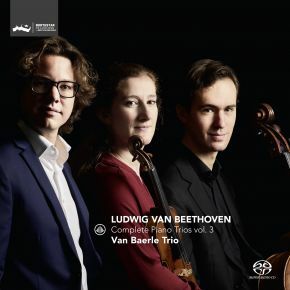 The year 1808 was a period of superlative productivity for Beethoven: In the midst of all this, Beethoven somehow found the time and energy to compose two major piano trios. They were completed while Beethoven was living with Countess Marie Erdödy, to whom the trios were also dedicated. Some previous piano trios were rather lengthy affairs with pretentions to the symphonic repertoire, but the opening movement of op. 70 no. 1 immediately lets the listener know that this time, things are different. The piece starts seemingly in medias res with a tempestuous figure in all three instruments at the same time. The second movement is the one that gave the trio its nickname ‘ghost’. Carl Czerny, Beethoven’s student, seems to have been the first to use this name. According to him, the movement ‘resembles an appearance from the underworld. One could think not inappropriately of the first appearance of the ghost in Hamlet’. Superficially, the sibling of the ‘Ghost’ may seem closer to Haydn and Mozart in style. For a long time, the Variations op. 44 were known as ‘Variations on an Original Theme’, as the first publication did not name the theme. It has since been identified as a theme by Dittersdorf. The variations were presumably written in 1792 and published in 1804, when various other early works were being offered to publishers.